Barron Rd. off of State route 17K in Montgomery, Parking is at the end of Barron rd. Ridge Rd. off of State route 17K in Montgomery, Parking is at the end of Ridge rd. Stewart is the most rideable, and user friendly of all of the riding areas. Offering Smooth and flowing single track, this is a great location for the Cyclist that is looking to get into single track for the first time, and is also equally as good for an advanced rider who is looking for a faster ride and more mileage. Ferncliff Forest Preserve is an out and back trail located near Rhinebeck, New York that features beautiful wild flowers. 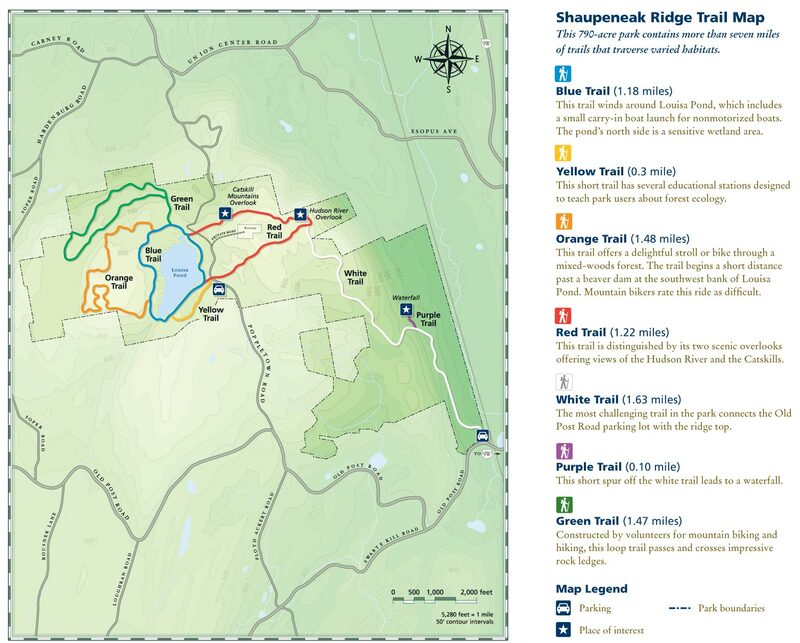 The trail is good for all skill levels and primarily used for birding, camping, hiking, road biking & walking. Dogs and horses are also able to use this trail. Head north on the Taconic State Parkway and get off at the exit for Route 199. Drive 3.7 miles and pick up Route 308 heading straight instead of bearing right. Drive 6.3 miles into the village of Rhinebeck, then turn right onto Route 9. Drive north and turn left onto Montgomery Street just before Northern Dutchess hospital. Drive another 0.6 of a mile and bear left at the fork onto Mount Rutsen Road. Continue driving 1.1 miles and turn left into the park entrance at the pull-off. The parking area is off Mt. Rutsen Road, near the intersection of River Road. Camping is allowed by permit only. Leantoos and fire places are provided as are a handful of picnick tables. Parking at the end of Reservoir Rd, which is off of Route 44. Illinois Mountain is a relatively new riding area, thanks to the efforts of the www.fatsinthecats.com. With only 4 trails, Illinois Mountain is a sleeper, as they get more and more difficult the further up the mountain you go, and most of it being slow going and technical. One of the nicest things about this riding area, is its paved parking and restrooms. Nearly 9 miles of trails of varying difficulty and length allow exploration of the preserve's myriad natural and scenic treasures. Please exercise caution if visiting during spring turkey or fall deer hunting seasons. Visit the state Department of Environmental Conservation website for current hunting schedules. Crossing Mid-Hudson Bridge from east to west, take Route 9W north for 8.2 miles. Left on Old Post Road. Lower parking lot is 0.2 miles on right. For upper lot, follow Old Post Road to Poppletown Road, which splits off to the right. Parking area is on the left, 2.5 miles from intersection of 9W and Old Post Road. The Sprain is on the border of Yonkers and Greenburgh, squeezed between the NYS Thruway on the West and the Sprain Brook Parkway on the East. The park has terrain that will suit the beginner to the advanced rider. It is an ideal park for Single speed bikes as the elevations are minimal. That’s not to say, there isn’t climbs…there are. Some of the most technical riding in Westchester resides in the park thanks to numerous tree falls, rock formations and tight trail layout. Take the Sprain Brook Parkway to the Jackson Ave Exit. Follow Jackson Ave West for about a quarter mile, and the park entrance is on your left. Follow the entrance round up to the pool area. Just past the entrance to the pool there is a huge parking lot. There are trail heads at the North-East & South-West corners of the lot that are marked with county signs. Highland Lakes State Park is the largest of the Palisades Interstate Park Commission’s undeveloped parks. There are no amenities; parking is limited. Geologically, the park consists of a series of low parallel ridges with lakes and wetlands in between. A part of the park near the lakes was known as Camp Orange and was a summer recreation area with many homes. The ruins of the old dwellings have long ago been removed but the foundations are still visible. The area is slowly returning to its original habitat. In a rare find for state parks in the NY NJ region, hunting is not allowed in the park. Still, be aware of illegal hunting. There are no official blazed trails, although a few sections of the old (now abandoned) Long Path route through the park may still have blazes. 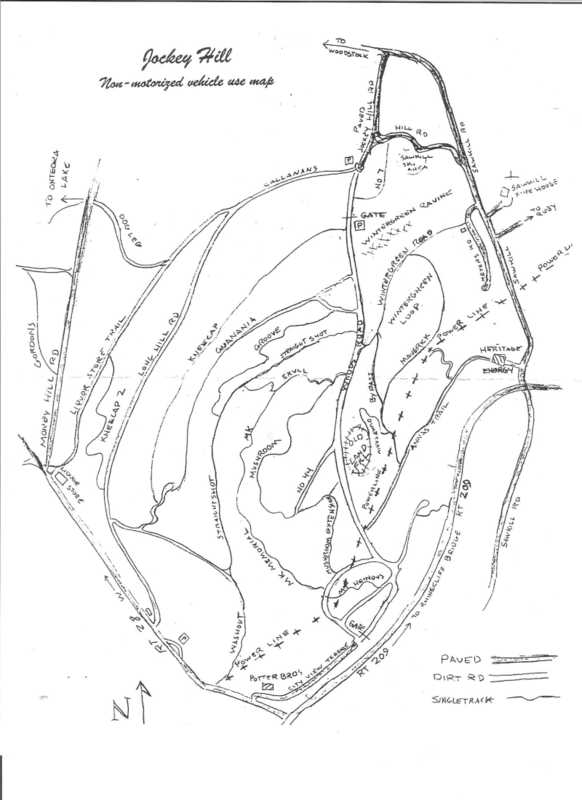 There is an expansive network of unmarked woods roads and trails facilitating loop hikes. No trail map exists, but zoom in on the parking map above in terrain mode to view the road network. These roads and informal trails, which meander among streams fields and lakes, can be muddy, in part because they are also used by equestrians (permit required) and mountain bikers (not sanctioned). From the NJ NY border near Suffern, take I-87 north about 15 miles to Exit 16 connecting to NY-17 west. When approaching the toll booths keep left to avoid traffic heading towards Woodbury Commons. Travel on NY-17 west for roughly 17 miles, take Exit 120 for NY 211 east toward Middletown/Montgomery. Travel 1 mile (four traffic lights) to Goshen Turnpike, turn left and travel 1 mile to Scotchtown Collabar Rd, turn right, 1.5 miles east to Tamms Rd, turn right, 0.5 mile to sharp bend in road. Parking is on the right. With These riding areas, bicycles are limited to the Carriage trails so here you will find a much less demanding ride, apart from the climbing! Along the way though, you will find some of the most beautiful views the Shawangunks have to offer, in addition to plenty of miles. This riding area is literally taylor made for mountain biking. 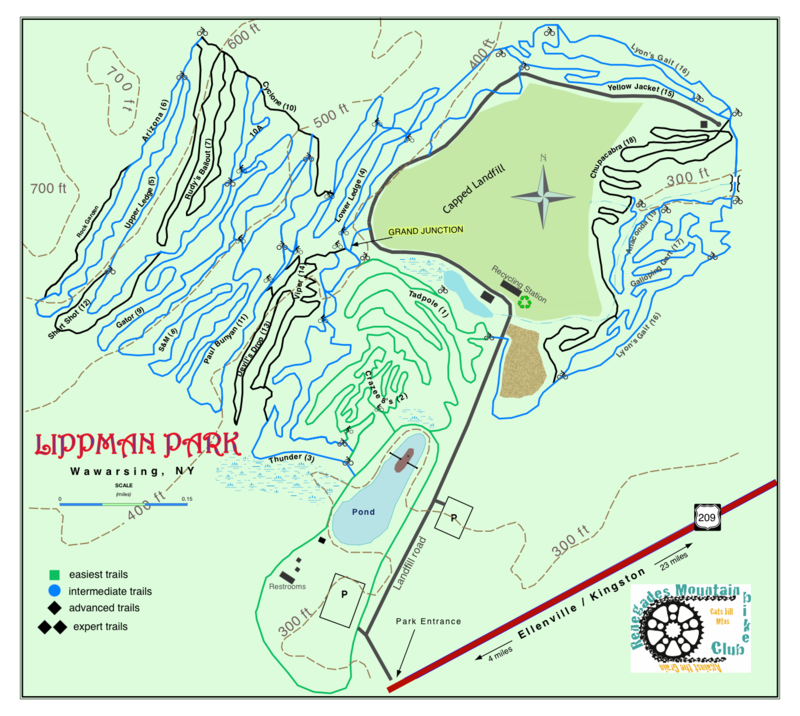 With everything from flowing, switchbacks with jumps and berms near the parking that cater to the childeren, to technical off camber and rocky single track nearer to the top of the mountain, and everything in between, Lippman park is one of the most progressive areas we have to ride in the Hudson Valley. Parking is Signed with “Lippman Park” off of route 209 in Warwarsing. Walnut has been developed by the Renegades, Just like Lippman Park. Look for a lot of the same, but with some smoother trails, and with some nice Ellevated trails near the top of the mountain. All trails may be used for biking in the Upper, Lower and Cross Country areas. There is no charge for the use of the trails; however, the trails can only be accessed by biking. The chairlift is not equipped to carry mountain bikes at this time. From Points North or South NYS Thruway (I-87) to Exit 19 - Kingston, NY - then Rt. 28, 37 miles West to Highmount. Belleayre will be on your left at the top of the hill after passing the Village of Pine Hill. 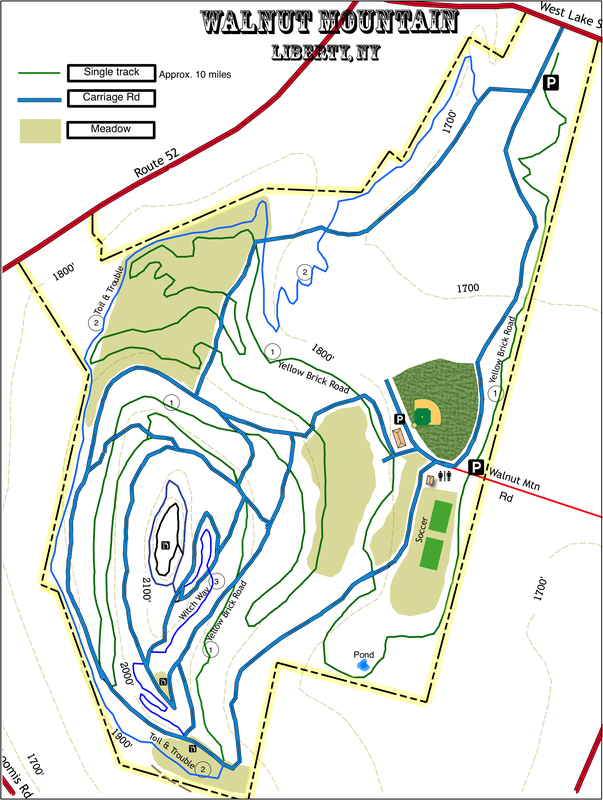 Use the following address for mapping: Belleayre Mountain, 181 Galli Curci Road, Highmount, NY 12441. Beacon....this one is not for the weary. If the climb up isn’t hard enough to get you to turn back, then be prepared for how rugged and rocky the Jeep roads and trails are. Be prepared to have some crashes at this one, and wear the extra protective gear that you pass on for the casual rides. We strongly recommend a minimum of 4 inches of suspension on your bike for Beacon. Park at the Scenic Hudson Parking lot on Route 9D, at the end of Howland Ave. From there, to start the ride and get to the Access road, Take Howland Ave to East Main st., then turn right onto the dirt road after Pocket Rd. From there, its about a mile to the Reservoir. The Ninham Mountain summit may be it's focal point, but this park has miles of trails for exploration. The trails are suitable for both hiking and biking, so it is very popular with mountain bikers who have few alternatives in the area. This park is also heavily used by hunters in season. In Putnam county 7 miles east of Fahnestock State Park. From the Taconic north, exit east on Peekskill Hollow Rd. to NY 301. Turn right on NY 301 aprx. 3.5 miles to a left on Gypsy Trail Road. There will be a sign and parking area on the right at 2 miles. Just beyond this point, Ninham Mountain Road turns off to the left, which also has limited parking. From Taconic south, exit at NY 301, head east and continue to Gypsy Trail Road. Some of the area's listed may have regulations or require a permit for biking. Allways check with the area before riding. You should allways wear a proper fitting helmet (New Yory State parks require it!) and bring plenty of water, an energy bar, a spare tube or patch kit, a pump, and a mini tool for trailside repairs. We have books and maps of many other rides available in the stores.